Reading and share top 9 famous quotes and sayings about Heads Or Tails by famous authors and people. 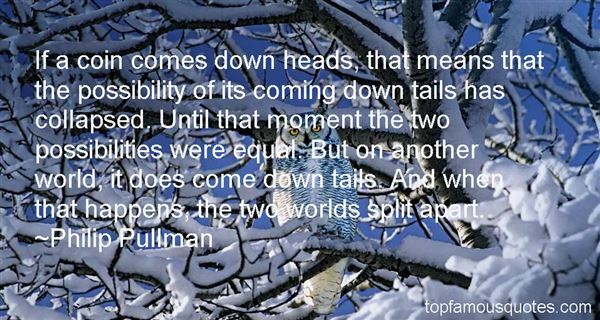 Browse top 9 famous quotes and sayings about Heads Or Tails by most favorite authors. 1. "Every betrayal contains a perfect moment, a coin stamped heads or tails with salvation on the other side. Betrayal is a friend I have known a long time, a two-faced goddess looking forward and back with a clear, earnest suspicion of good fortune." 2. "At the far end of this infinite distance a coin is being spun which will come down heads or tails. How will you wager? Reason cannot make you choose either, reason cannot prove either wrong." 3. "That my life has come down to this – luck, is galling, when I have always directed my own fate. Land or water? Heads or tails? Life or death? We'll see." 4. "I can follow pretty much every programming language out there, I can make a two-hundred-year-old diary out of some really nasty ingredients, I can even make sense out of the instruction booklets that come with IKEA furniture, but I can*not* make heads or tails of this nonsense right here." 5. 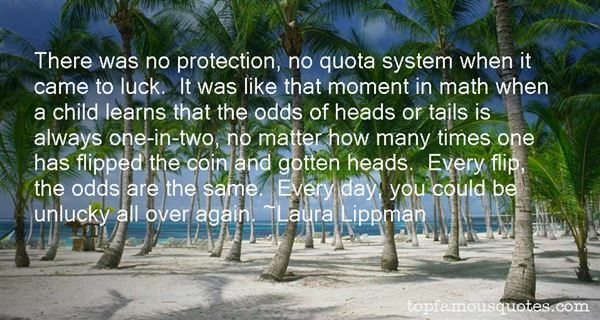 "There was no protection, no quota system when it came to luck. It was like that moment in math when a child learns that the odds of heads or tails is always one-in-two, no matter how many times one has flipped the coin and gotten heads. Every flip, the odds are the same. Every day, you could be unlucky all over again." 6. "Maybe we're standing like coins on the edge? "Allie considered this. "Meaning? ""Meaning, we might be able to shake things up a little, and find a way to come up heads. ""Or tails," suggested Allie. "What are you talking about?" said Lief. "Life and death." 7. 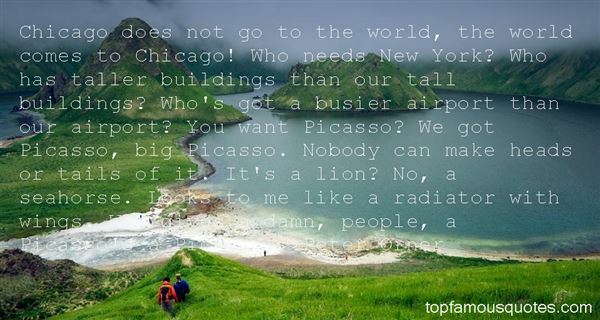 "Chicago does not go to the world, the world comes to Chicago! Who needs New York? Who has taller buildings than our tall buildings? Who's got a busier airport than our airport? You want Picasso? We got Picasso, big Picasso. Nobody can make heads or tails of it. It's a lion? No, a seahorse. Looks to me like a radiator with wings. Who gives a damn, people, a Picasso's a Picasso." 8. "If a coin comes down heads, that means that the possibility of its coming down tails has collapsed. Until that moment the two possibilities were equal. But on another world, it does come down tails. And when that happens, the two worlds split apart." 9. "His chest, heaving harder this time. His words, almost gasping this time. "You destroy me. "I am falling to pieces in his arms.My fists are full of unlucky pennies and my heart is a jukebox demanding a few nickels and my head is flipping quarters heads or tails heads or tails heads or tails heads or tails"Juliette," he says, and he mouths the name, barely speaking at all, and he's pouring molten lava into my limbs and I never even knew I could melt straight to death. "I want you," he says. He says "I want all of you. I want you inside and out and catching your breath and aching for me like I ache for you." He says it like it's a lit cigarette lodged in his throat, like he wants to dip me in warm honey and he says "It's never been a secret. I've never tried to hide that from you. I've never pretended I wanted anything less." I really thought I was pretty good before I saw Hendrix, and then I thought: Yeah, not so good."